It is interesting to consider how the development of the World Wide Web has affected the work of the untrained artist. Like all artists, folk artists reflect the world they see around them, and have always been affected by the media. 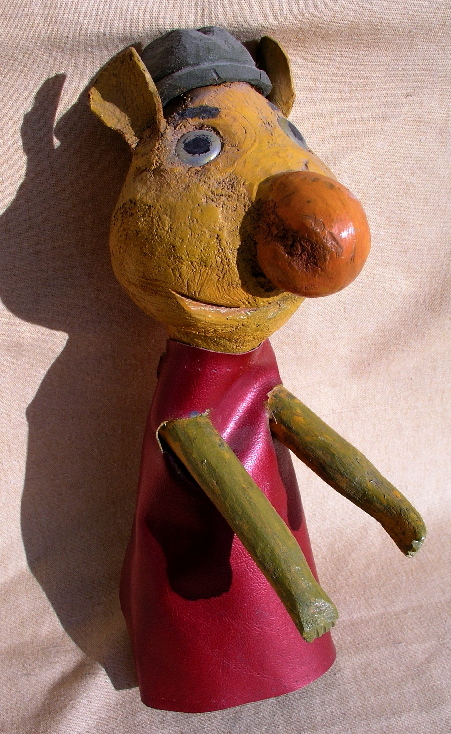 An example is in the work of Ewald Rentz who liked watching Sesame Street on t.v., and so produced sculptures of many of the main characters. But internet access does not have the same effect as watching television. Television focuses our attention, sometimes helping to create cultural icons such as Kermit the Frog. The internet spreads our attention, giving us access to a much wider, but therefore more unfocused body of information. Things go “viral” and disappear within days, being replaced by the next “flash in the pan”. But more importantly the web also provides an interested individual the possibility to easily research any given subject. It is reasonable to assume that most modern folk artists will at some point use the internet to look at the work of other folk artists. Previously this information would have been available only to those who had access to reference books, or could travel to an exhibition or sale. Overall this means that if they are so inclined, artists are being more influenced by each other, and if their motivation is to sell more folk art, they will look at and emulate what’s selling. This encourages fashion or trends which might be considered a negative. However, to a large extent ‘twas ever thus. Artists have always looked at each other’s work, and if they like what they see, they will consciously or unconsciously emulate it. The more interesting affect therefore is on the potential for an artist to develop an audience or market for his or her work from their home by creating a web site, and/ or joining a communal web site specializing in their type of work. This has the potential to encourage and support many who would otherwise never be discovered. A real God send to those who live in remote places. Of course it isn’t as simple as throwing up a few pictures up and waiting for the phone to ring. One still has to promote and be reliable in transactions, etc., but the potential is now much greater for a talented individual to be discovered by their audience, and thus support their output. This is a 1953 newspaper photo of Albert’s granddaughter Ruth Marr , the lady who was kind enough to bring in the clippings. 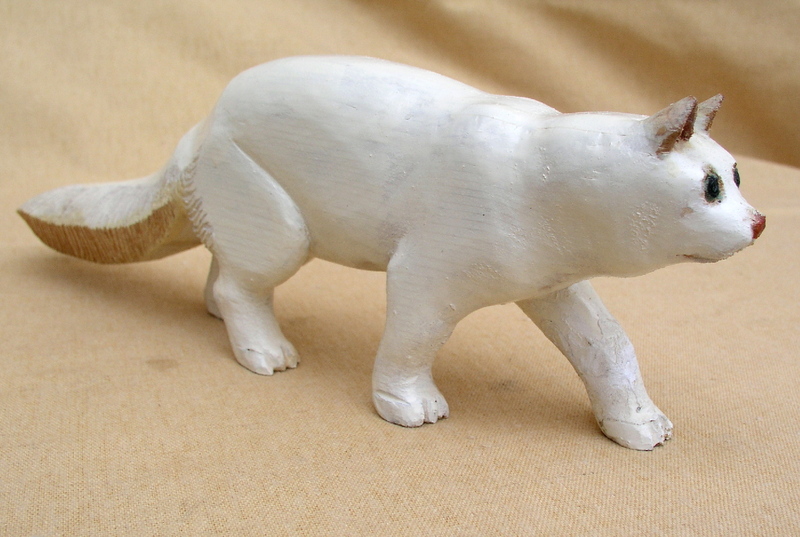 Below is the carving Albert made of her favourite cat. DUNNVILLE (Special) – Sincere expressions of artistic talent may often flower off the beaten track and it is in this way that what many feel is a genuine contribution to Canadian folk art has been made in the Stromness a few miles south and east of Dunnville. In this quiet hamlet off the main routes of travel J.A.Hoto a retired farmer has created in the past three years a gallery wood carvings that may stand in their own right any comparisons with the best of the more celebrated French Canadian art. Colored with an unerring eye and a bright and refreshing taste, and carved with an unselfconscious feeling for animal and human form, the little figures have an almost irresistible appeal to young and old. Mr. Hoto who calls his creative impulse merely a hobby has been a farmer all his life in the township of Sherbrooke in which he lives now. He recalls that as a youth he was talented with a jack- knife and at sketching, but when he took up the profession of farming he laid his artistic gift to one side for lack of time. With his retirement five years ago this thoughts turned once more to the interest of his youth butit was not until three years ago that he once more took up wood carving. Since that time he has completed a collection of carved figures, animal and human, that include a stagecoach and train, a racing Roman chariot being pulled at a gallop by a span of four dabbled horses and a tableau of 40 native Canadian birds in their exact colours and stances. Partial recognition of his talent was received by Mr. Hoto at this year’s CNE when he took the exhibitions second prize in the hobby class for the three dimensional representation of a brewery wagon pulled by a team of six horses. The work is complete with miniature barrels ready for delivery and a driver sawing at the reins as he controls the team. The work was completed during spare moments in about a month’s time. A specialty of Mr Hoto’s are carvings of game birds in flight. These include Canada geese, pheasant and ducks colored naturally and carved with an amazing feeling for movement. Many of these are to be seen in the homes of district people . U.S. tourists have been quick to recognize the originality of Mr. Hoto’s carvings and have purchased many of the plaques. The larger groups which consist of wagons and horses in action plyus human figures and an occasional dog running pell-mell alongside are not offered for sale. These, Mr. Hoto wishes to keep, but he will sometimes offer to carve a replica of any of his smaller works for those who appear interested. Mr. Hoto’s workshop is a tiny room in a neat little shed in which there is barely room for himself and his current projects. Here surrounded by animal pictures clipped from illustrated newspapers and magazines he creates his models of the life he has glimpsed about him on the farm and local towns and villages. The front portion of a garage facing the village street is wired off and in glass cases made by himself many carvings are displayed. Asked where he gets his ideas for carvings, Mr Hoto only smiled and observed they just came to him. Some he stated were suggested by cronies. Their influence he indicated had encouraged him to tackle his Exhibition exhibit. His farm experience he said had given him his eye for carving the various gates of horses and the outlines of livestock. This ability enables him to cut the living outline of a horse or cow out of a blank piece of paper in 60 seconds with no model or preliminary sketch to assist him. I was recently surprised and delighted when a picker from the Niagara Peninsula brought me in 8 small wood carvings by Albert Hoto . I very occasionally run across work from this highly skilled carver from Stromness, Ontario, and I’m delighted when I do because in my opinion he is a “top drawer” Canadian folk artist. I would suggest he deserves this classification not only for his artistry and skill, but also his dedication to the work. He kept at it out there in his workshop. Producing thousands of finely detailed and original carvings of horses, farm scenes, wild birds, domestic and farm animals,etc., He was a natural, working his magic with his only a few tools; a jackknife, a coping saw, and a great deal of patience. He is well documented and illustrated in books such as the Price’s ’twas ever thus, and many others . Within a month of my posting the pieces on the Shadfly website, I was contacted by Mr. Hoto’s grand daughter, Mrs. Ruth Marr. She was friendly and helpful, and I am thankful that her interest is such that she made the effort to come to the shop to allow me to copy clippings and to tell me about her grandfather, I enjoyed the articles and photos and I am happy to pass this information on. What follows is a short biography based on Ruth’s information and an unnamed local clipping from 1956. 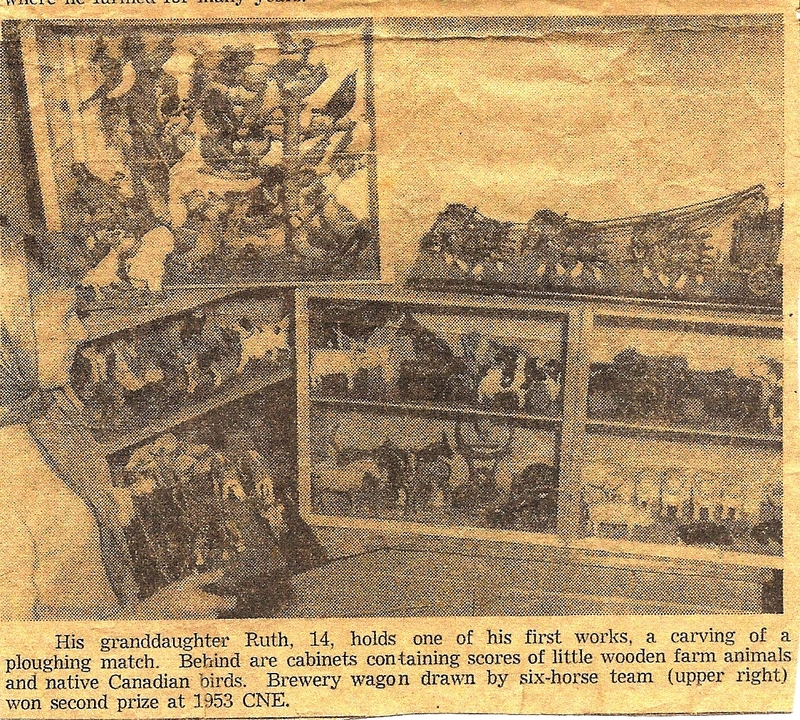 Also, I have reproduced in it’s entirety, a clipping from an unnamed Toronto newspaper from 1953, the year his carving of a brewery wagon drawn by a six horse team won second prize for at the Canadian National Exhibition. I chose to use a quote from an attached photo caption from this article for the title. Albert, as he was known, Hoto was born on the family farm in Stromness Station, south of the Welland canal near Dunnville, Ontario. He had three brothers and two sisters. He lived and worked on the farm until he married Florence Geneva Spellman on November 21, 1908. They bought a farm nearby in Sherbrooke, Ontario. They worked the farm and raised three daughters, Dorothy, Marjorie, and Gladys . In 1948 Albert retired and sold the farm. They built a home in Stromness along the feeder canal that runs between the Welland canal and the Grand River. After working hard on the farm for so many years Albert found retirement difficult. In 1950 he decided to take up the slack hours with wood carving. He picked up his jack knife and set at it. “I just couldn’t sit back in a rocking chair when I retired” he said”I had to keep doing something”. 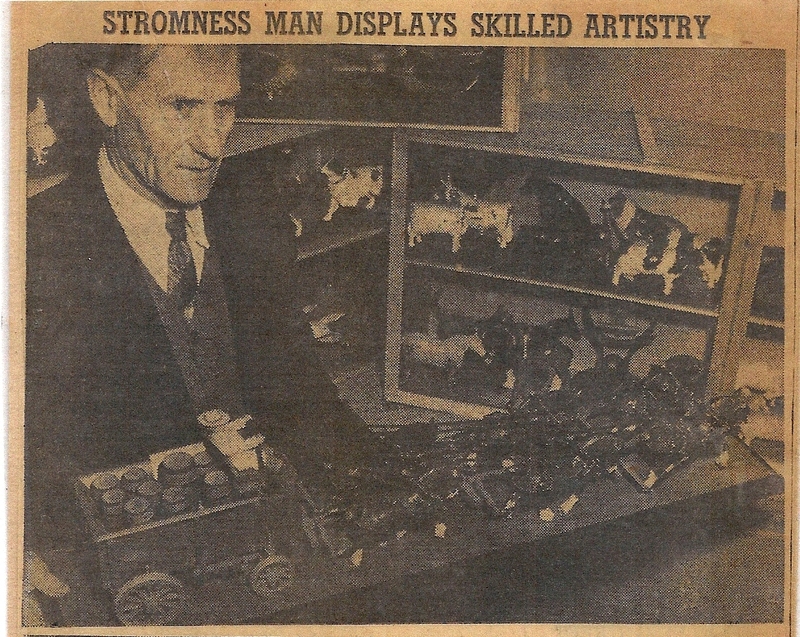 In 1953, three years after starting , he received wide praise and attention when he won second prize for his carving of a brewery wagon at the C.N.E. Soon he hung a white sign with neatly painted black letters in front of his small showroom stating only “Ornamental Woodcarving”. He was prolific and sales were brisk. This trend continued as his reputation spread. He won more prizes in some important competitions such as the International Hobby Show in Toronto in 1956. “My work is pretty well distributed’ he noted. He sold carvings to people from the area who would visit him at his workshop during summer months. 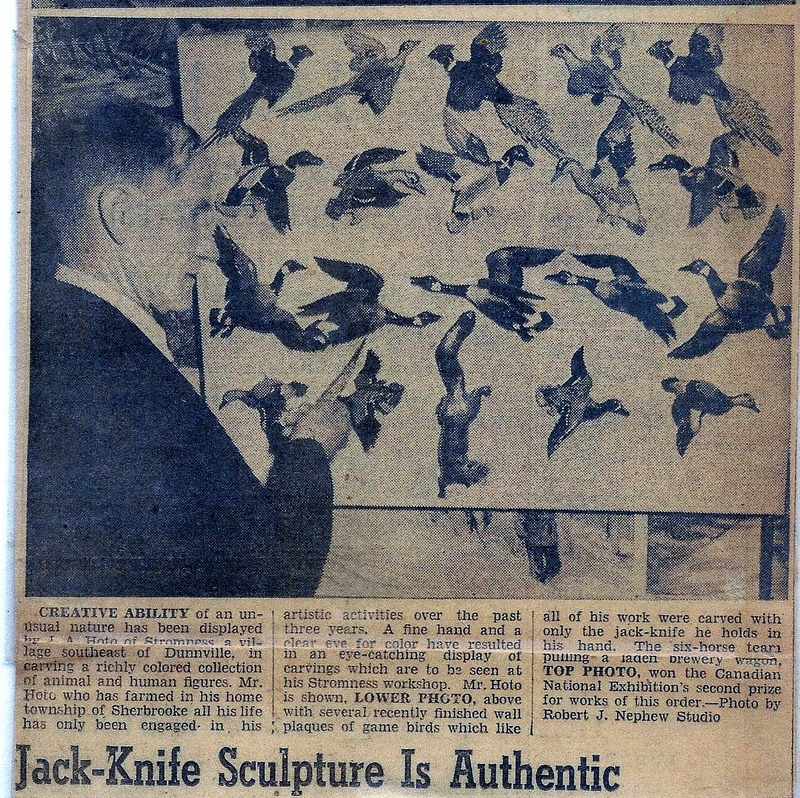 Eventually his work was bought by serious collectors from across Canada and the United States . Using only a bone handled jack knife and a coping saw, and without any formal artistic education he created a miniature world with diminutive representations of rural life. 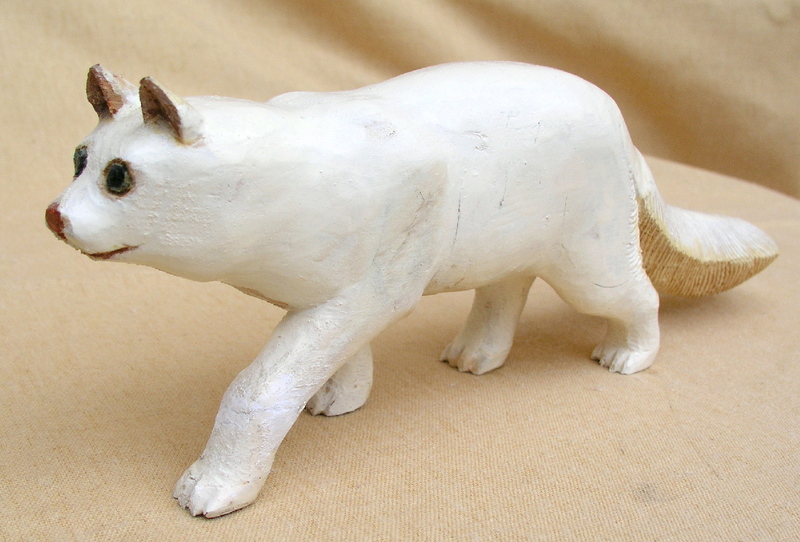 He carved with an unselfconscious feeling for animal and human form. He stated that his farm experience had given him an eye carving the various gates of horses and the outlines of live stock. 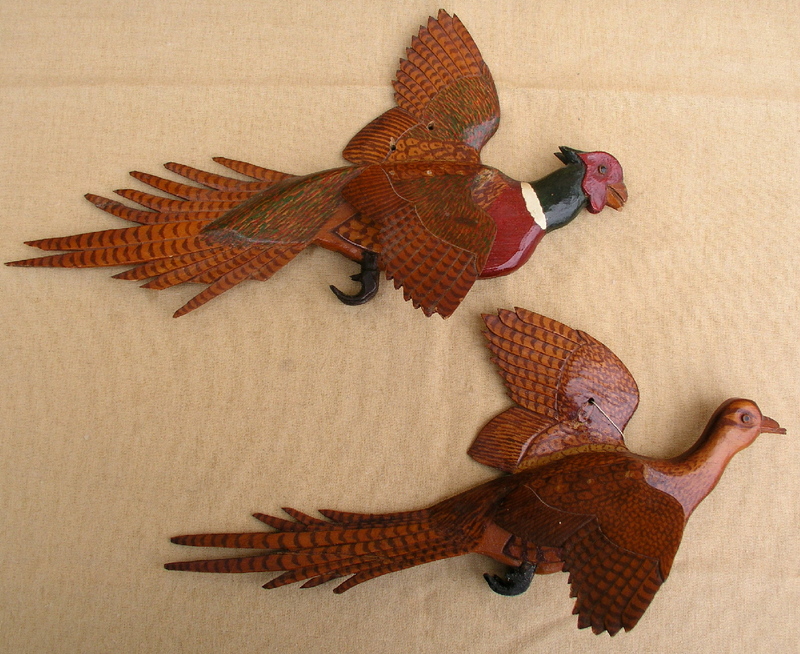 Alongside his farm carvings, his specialty became the carvings of game birds in flight. These are renowned for their natural colouring and amazing feeling of movement. Mr. Hoto denied that it took great patience to produce the intricate works. “If you are doing something that you like” he explained” it is never work.” I don’t feel that it takes too much patience for me. I like the work, and the time seems to go easily”. 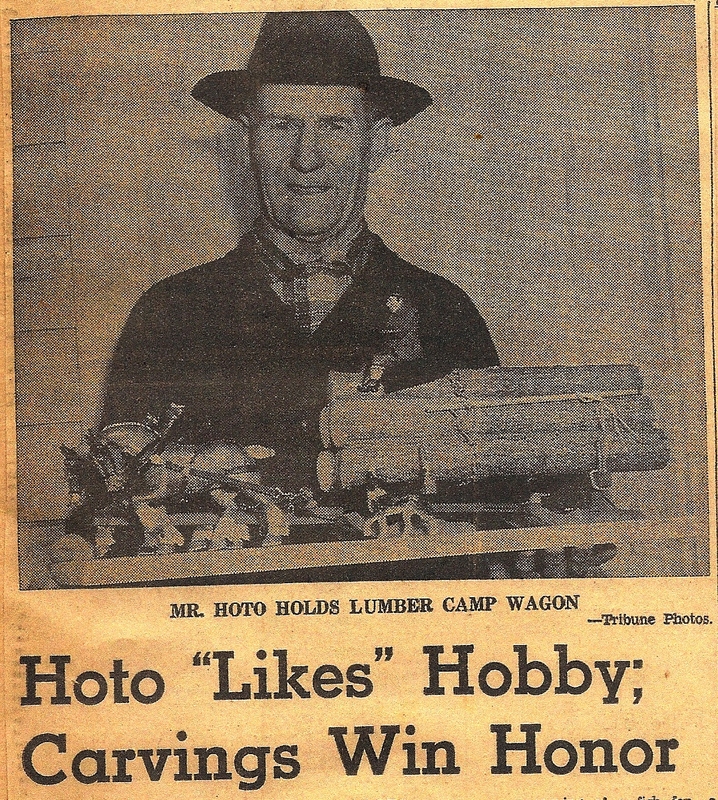 Mr. Hoto continued to work and sell his carvings from his home workshop until his death at age 93 in 1979.